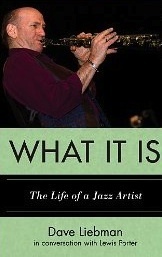 Dave Liebman has always been one of the smartest and most forthcoming musicians of his generation, and in his new book, What It Is: The Life of a Jazz Artist, the saxophonist and educator holds forth on his art, life and restless creative spirit with effortless candor and lyricism. Compiled from interviews conducted by pianist, author and historian Lewis Porter, What It Is smoothly encompasses the full breadth of Liebman’s career. Lieb was playing in small combos from the time he was a teenager, but it wasn’t until a 1962 visit to Birdland to see John Coltrane that the Jewish kid from Brooklyn saw his future path laid out (“Once you see the light,” he says of Trane’s playing, “you can never turn away again”). The ensuing half-century would see Liebman playing with Trane’s old boss Miles Davis, and with his thunderous former drummer Elvin Jones; making his mark on fusion and the free music of the ’70s New York Loft scene; fronting his own well-regarded groups with an ever-shifting and idiosyncratic cast of musical luminaries (notably drummer Bob Moses, his earliest jazz connection, and the mercurial but brilliant pianist Richie Beirach); forging an outstanding additional career as a jazz educator, capped by his founding of the estimable International Association of Schools of Jazz; and collecting a raft of important awards, including last year’s designation as a Jazz Master by the National Endowment for the Arts. Given these plaudits and the world-class career that occasioned them, it’s remarkable that the man who emerges in What It Is shares himself with such directness and lack of pretension. Liebman acknowledges the debt he owes to the giants that preceded him, while still being honest enough to cite his issues with them, both personally and creatively (he fully admits that he began his sojourn with Davis at creative loggerheads with his new bandleader: “At first I had no idea what the hell we were playing”). He is forthright on jazz’s complicated relationship with drugs and race, providing especially welcome insights on the latter, given his dual perspective as both a white man and a Jew. Liebman has a refreshingly down-to-earth view of his own legacy as a musician, but he recognizes the importance of his responsibility to properly instruct and influence the next generation of jazz talent. The saxophonist also exhibits a pleasantly spiritual side, mystical without being overbearing; he tells wonderful anecdotes of a trip to the Sahara occasioned by past-life visions of himself as a desert musician. Porter proves a skilled interviewer, gracefully guiding Liebman from topic to topic while occasionally contributing his own thoughts on the subjects at hand. The obvious conviviality of the interview sessions carries over to the reading experience itself, making What It Is a brisk, intelligent, always entertaining journey through the life of one of contemporary jazz’s most inexhaustibly engaging artists.